The rugged beauty of the Sorrentine Peninsula may suggest it would be impossible to squeeze large hotels into its nooks and crevices, but along the top of its sheer cliffs and tucked into gaps above the tiny beaches and sea pool platforms are all manner of alluring accommodation options. 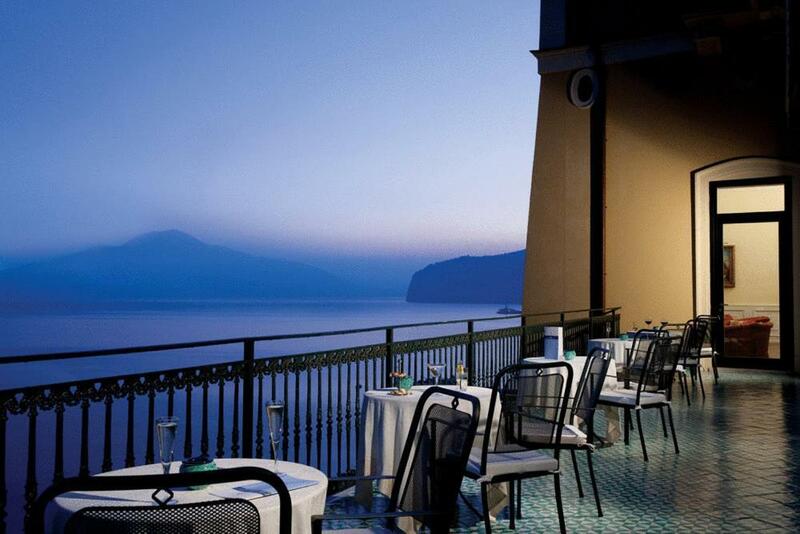 Central Sorrento hotels include the stylish Jannuzzi, traditional Antiche, or the grand hotels Excelsior and Tramontano. 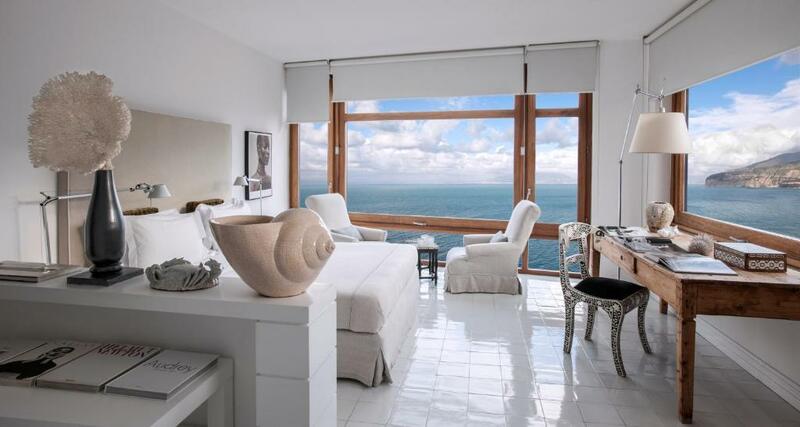 Up the hill, with commanding views over the bay, La Minervetta is brimming with character. A little further out are 1960s cool Modernist choices like the glorious Parco dei Principi and Aminta. 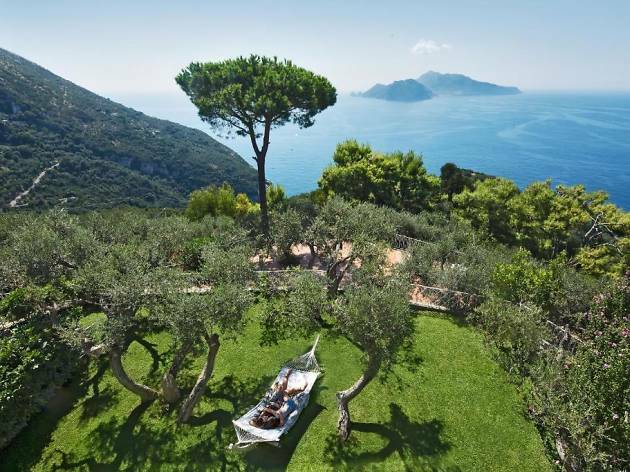 Boutique hotel and restaurant Don Alfonso is a must-stay for Michelin-starred dining, and the Relais Blu is a perfect romantic hideaway in the heart of the Punta Campanella marine reserve. Wherever you stay, the gorgeous villas, vineyards and lemon groves of the region are all within easy reach. 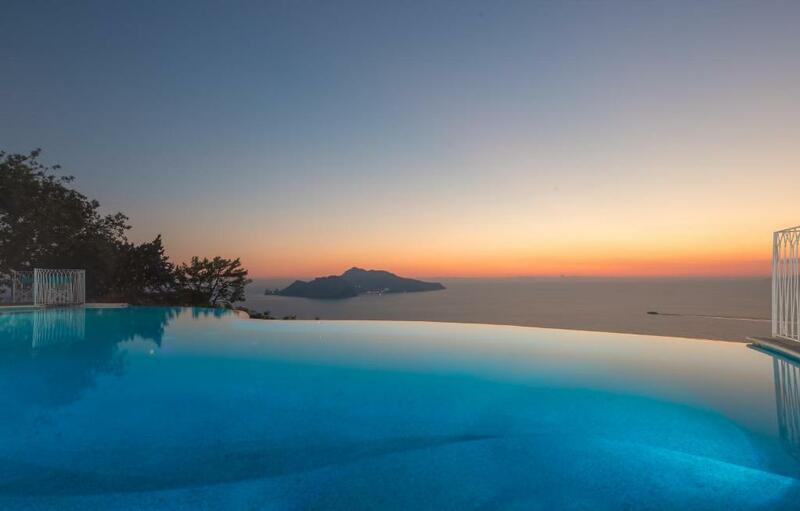 One of the loveliest things about this boutique hotel is its location; set in the heart of the Punta Campanella marine reserve, it has wonderful views of Capri, Ischia, Procida and Vesuvius. 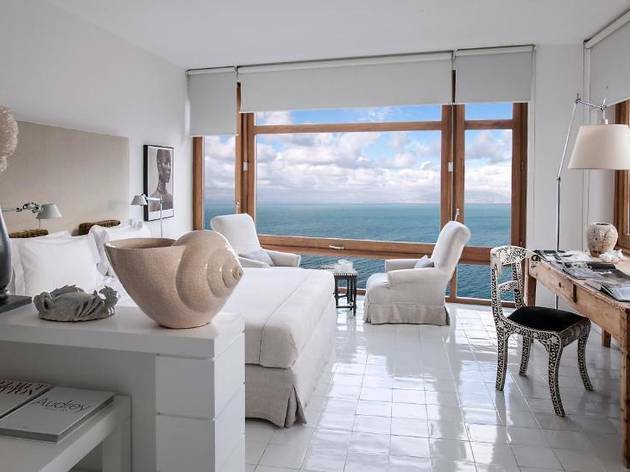 Rooms are simply styled with vast expanses of white interspersed with splashes of Mediterranean turquoise, with a mix of contemporary and retro furnishings. There’s also fine-dining from chef Roberto Allocca. On site is a small infinity pool and a new spa, but if you’d rather beach it, it’s a short a taxi ride to the Marina Cantone beach, where you can hire a boat and/or take a stroll to the lovely La Conca del Sogno restaurant in Recommone. 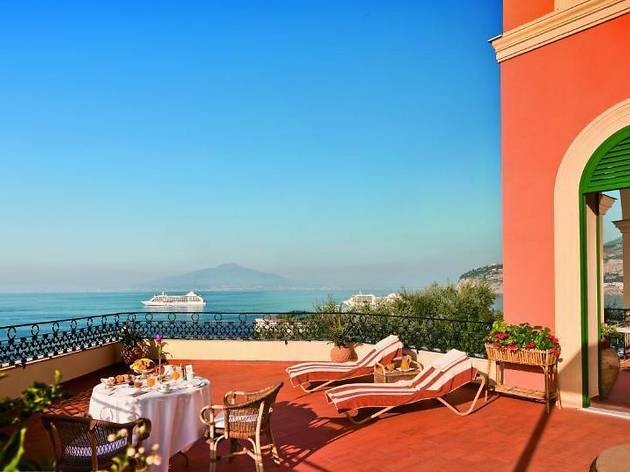 A five- or ten-minute walk from Sorrento’s centre, La Minervetta has a spectacular position overlooking the Marina Grande, and it’s easily one of the most stylish places to stay on the Sorrentine coast. 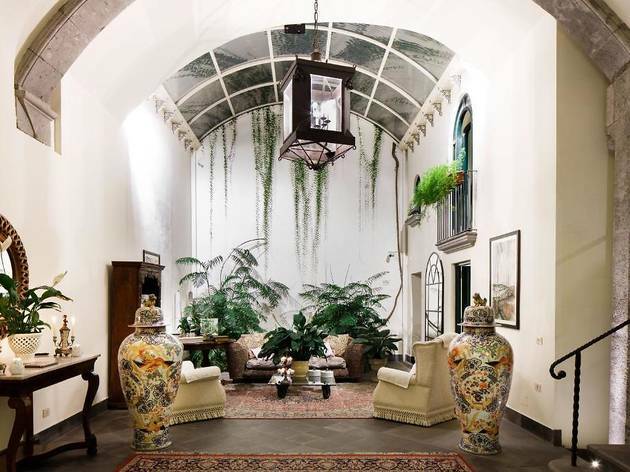 Run by Marco, an interior designer, and his wife Eugenia, it’s brimming with character. Each room is individually styled in bold colours, with a nautical theme, plus books, boats, and other ephemera collected over the years. A dining area serves excellent breakfasts, and beyond it lie a lounge are and sun terrace; another terrace with a small (unheated) pool, has private steps down to Marina Grande. One of the best reasons to venture beyond Sorrento is to sample the two-Michelin starred food of Alfonso Iaccarino and his son Ernesto. And to really enjoy it, you might as well book a room. Each has been styled (by the same team behind La Minervetta) in a delicious combination of bright and pastel colours. 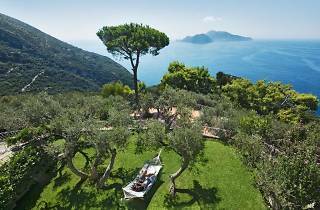 The garden and pool are very restful, and the reception area charming, but really you’re just biding your time until dinner, the ingredients for which are harvested from Iaccarino’s organic farm in the Punta Campanella. If you’re inspired, cooking classes are also available. 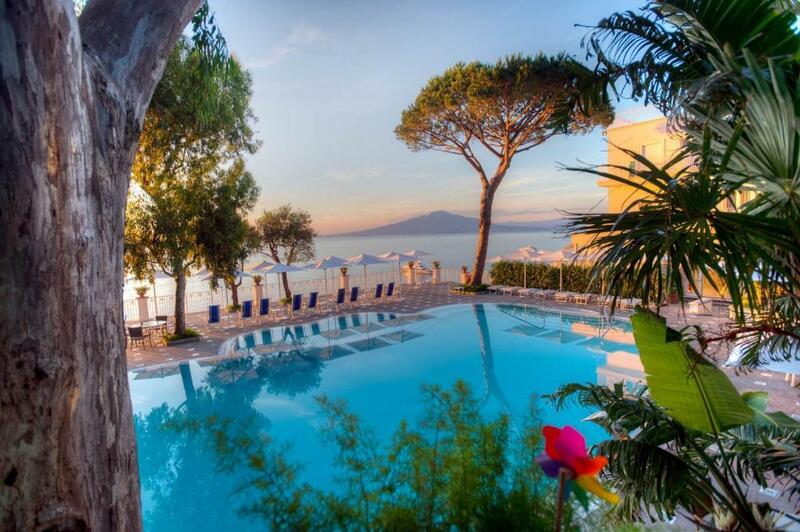 The grandest of Sorrento’s grand hotels is set in five acres of orange and lemon groves, giving it a wonderfully peaceful atmosphere in spite of its central location. 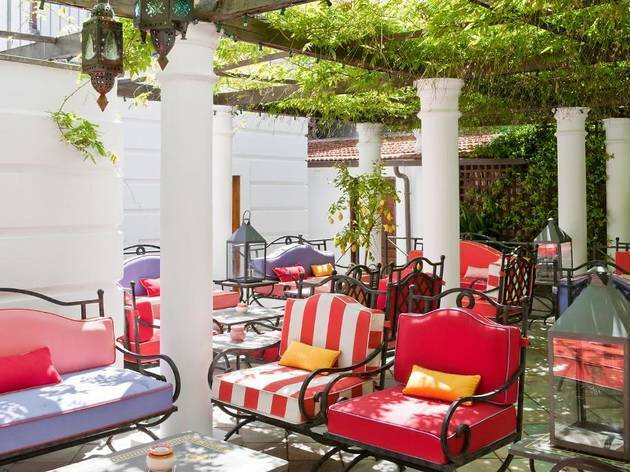 Spacious elegant rooms have period furniture, perhaps frescoed ceilings and 19th-century antiques, and all have terraces overlooking the sea or gardens. 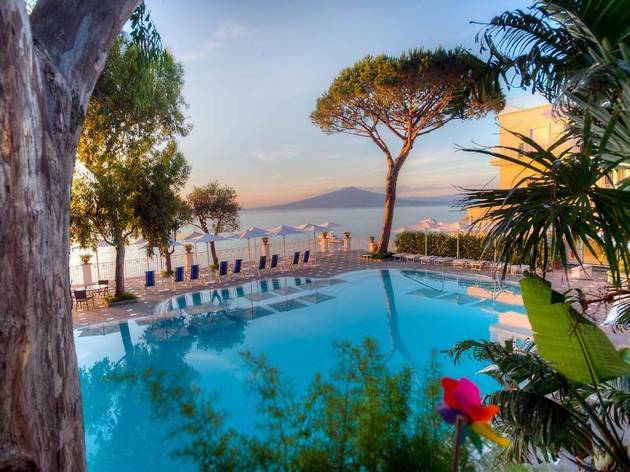 A holistic centre is set in the hotel’s renovated 19th-century greenhouse, and there’s Michelin-starred dining to be enjoyed at the Terrazza Bosquet restaurant, which has spectacular views over the Bay of Naples. Slap-bang in the centre of Sorrento, Jannuzzi is a family-run boutique B&B that was designed by local architect/designer Marco de Luca (of La Minervetta fame). 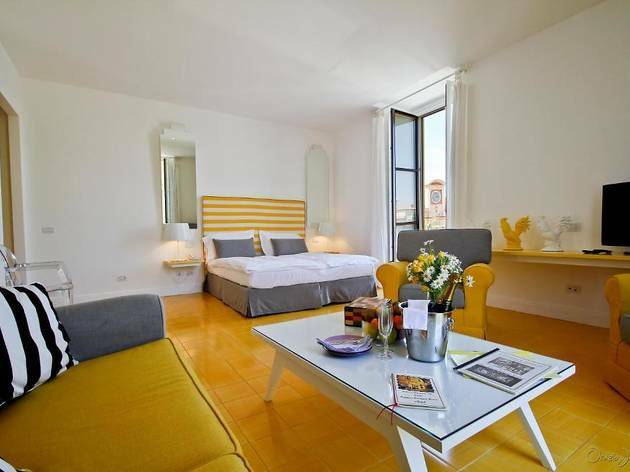 With a dazzling palette of yellow, white and black, rooms are stylish and spacious, some with terraces, and there’s an apartment complete with its own terrace, kitchen and, er, exercise bike. Breakfasts, including daily baked pastries, on the terrace are something else. The location is perfect for local shopping, restaurants and bars, and it’s a short walk to the port for boat trips. 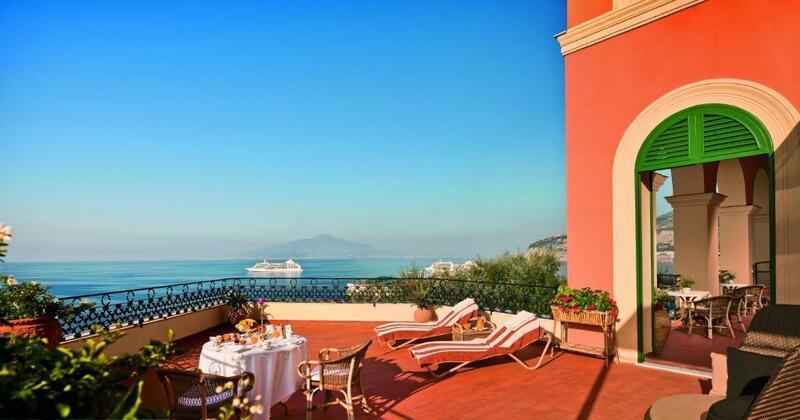 There are few better views of the sea and Vesuvius than from the terraces of this 4-star grand hotel. 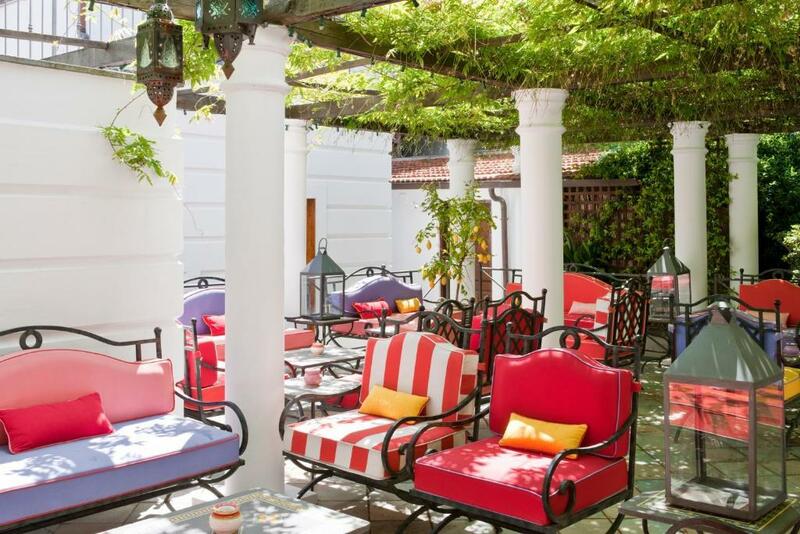 Public frescoed areas are furnished with oriental carpets, majolica tiles and antique paintings, while elegant rooms have views of the sea or the beautiful Mediterranean gardens. 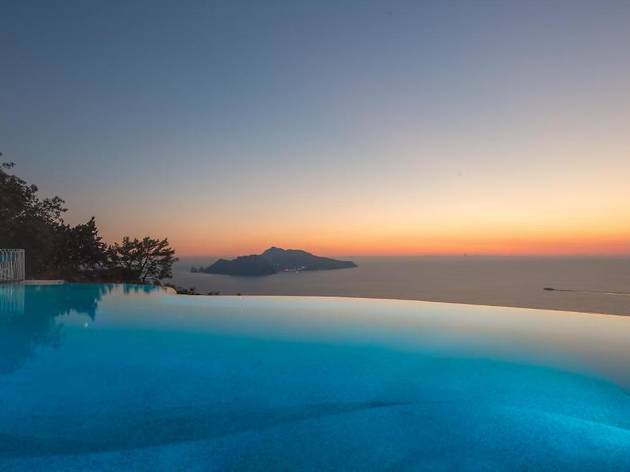 There’s a pool, access to the beach via a lift, and the kitchen is under the supervision of Alfonso Iaccarino, of two-Michelin-starred Don Alfonso 1890 fame. There’s even a chapel, a frescoed jewel that dates back to 1500, though completely restored in 1890. 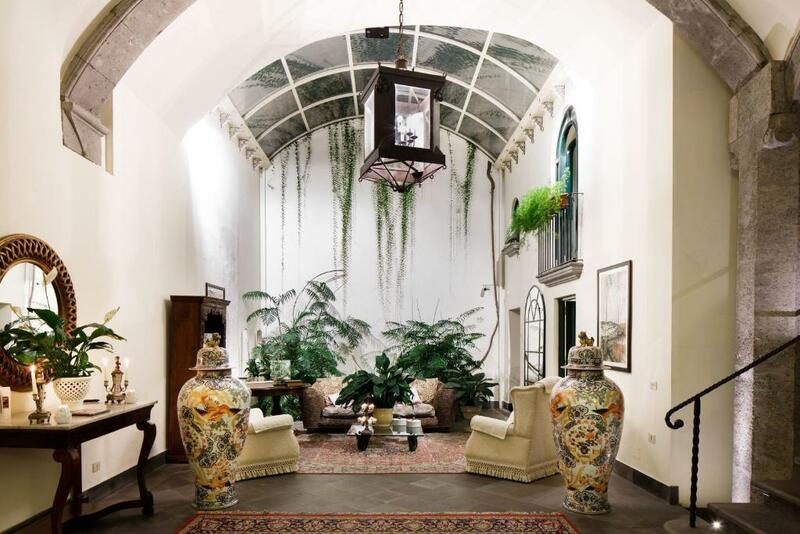 Once the residence of the Savarese family, this 15th-century building has been sensitively converted into an intimate luxury hotel, while maintaining plenty of the original Catalan-Durazzo architectural features in the public areas. 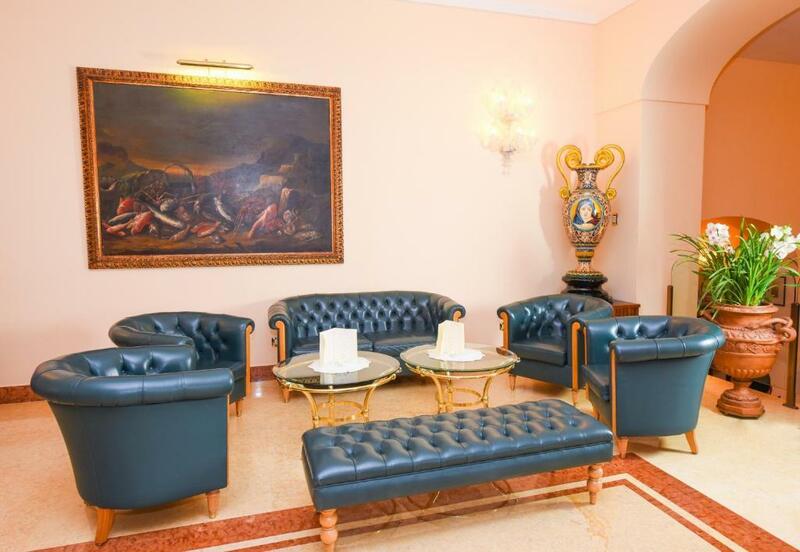 The hotel, overlooking the gardens of Piazza San Francesco and not far from the 14th-century San Francesco cloister and Villa Comunale, is centrally located for shops and restaurants. 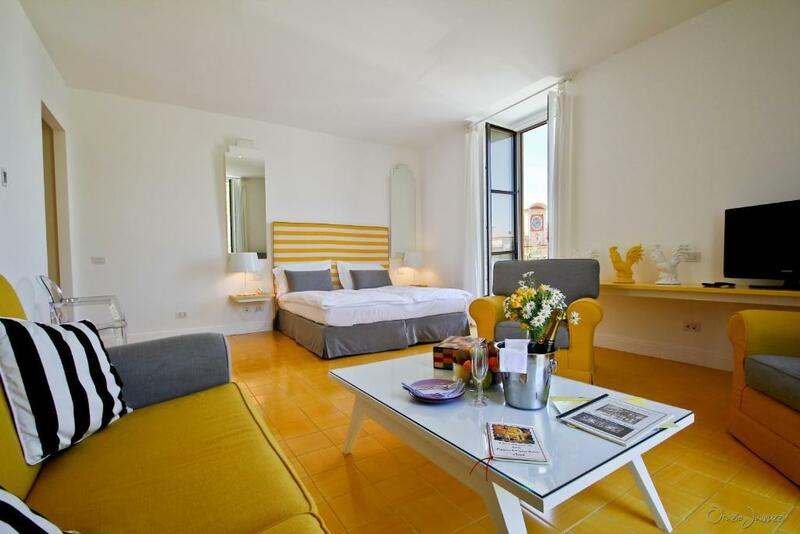 Rooms are more contemporary, and the Marziale Suite has its own interior garden patio. Two restaurants both serve traditional Italian cuisine with a modern twist. A mile for the centre of Sorrento, this wonderful Modernist creation, set within a park, was dreamt up by Giò Ponti. One of Italy's most important architects, Ponti designed the 'Superleggera' (a 'super-light' chair that a child could pick up) and the iconic Pirelli building in Milan, and here at Parco, he created everything from the furniture to the floor tiles, which are all set differently to create unique designs in each room. 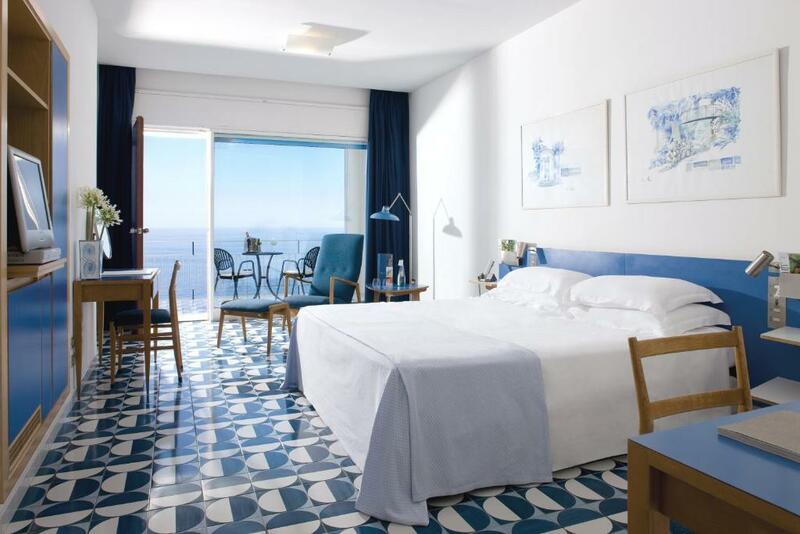 A wonderfully fresh marine palette of blue and white extends throughout, from the simple rooms to the restaurant and the lovely seawater pool. Another very cool looking hotel, 4-star Aminta has retained its 1960s styling in the common areas, including a wonderful curved central staircase, wide windows, and tiled flooring. 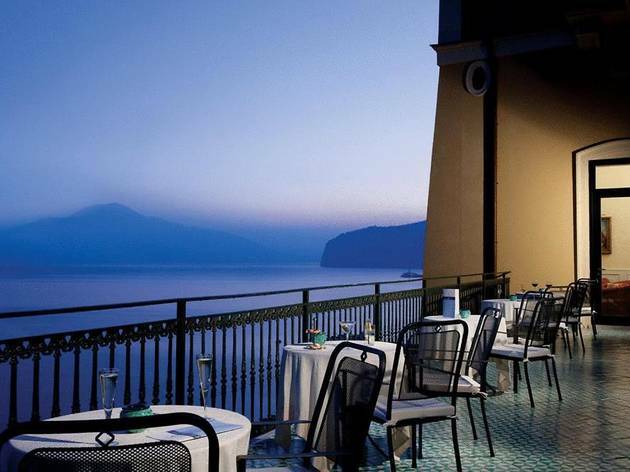 It’s a little way out of Sorrento (there's a shuttle bus) but, perched on a hillside, the hotel has great views of the Bay of Naples and Vesuvius. Rooms, while not exactly cutting-edge, are clean and comfortable. There's an on-site restaurant and bar, and the terraces are lovely for lunch, dinner and cocktails. Around the fabulous heated pool there’s summer entertainment, and plenty of excursions are available. 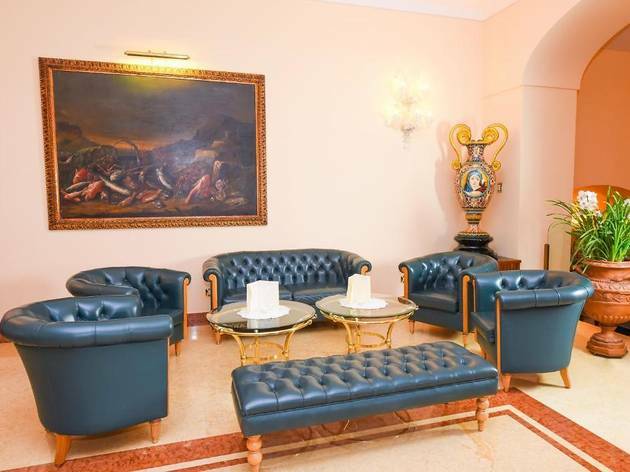 A traditional hotel in the heart of Sorrento town centre, Antiche Mura is situated beside the ancient walls that once protected the city from would-be attackers. 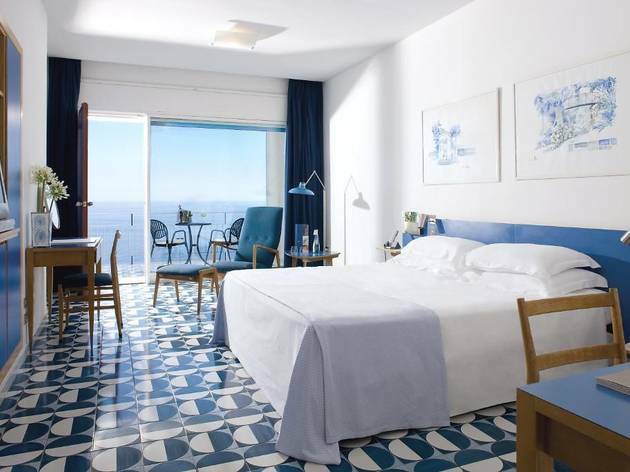 Rooms have hand-painted tiled floors and marble bathrooms. Breakfasts are legendary, with a staggering array of pastries and cakes served in a lovely Art Nouveau-style dining room. During the summer, simple food is served around the outdoor pool, set gorgeously in a citrus grove garden. Half board is available using an off-site restaurant located in the main square in front of the hotel.